Realistically, her position to impact policy on the national level is not particularly favorable. As a socialist, Ocasio-Cortez will be isolated in Congress. Most of her colleagues, Republican or Democrat, are opportunists, conservatives, or plain reactionaries. Even among the “progressives” of the House, she is singular in her political consciousness and independence from the Democratic Party’s institutional checks on meaningful political action. Her presence in Congress has powerful symbolism, yet her actual influence will be hampered by the sheer inertia of most of her fellow Democrats. Democrats who don’t belong to the party’s left-leaning camp are aware of the rising tide of discontent among their base and rank and file. Of course, some, like Tammy Duckworth, will go to their grave denying anything like mass support for leftist policies exists anywhere outside of New York city. Many others who do change their rhetoric a little cannot be trusted. They will never throw away the network of deals and social connections that underlie their power (and their future enrichment) for a meaningful reformist program. With this victory, we need to reflect on the relationship between elections and the aims and development of our movement. Electoral gains must translate into a new political and social movement capable of not just advocating reforms but fighting for them through social mobilization. It cannot be another political party amongst others but must embody, through the ties it fosters among its members, social principles fundamentally opposed to those of bourgeois society. Socialism right now speaks to people in the language of reforms, to which they respond positively. The experience of everyday life under capitalism produces approval among working people for policies like Medicare for All and fully funded public education, while the current political conjuncture is one of a mass rejection of the “mainstream”. When a socialist campaigns well on a reformist platform against an incumbent who could only maintain power through political apathy, it is only a matter of tapping into an already formed social mood. This formula will most likely produce several further victories. However, the interest of the electorate in socialism may be brief, if it is not substantiated by a consolidation of socialist consciousness at the grassroots. If the Democrats keep at their usual cynicism, rhetorically moving to the left yet doing nothing, then public opinion which favored progressive reforms will grow apathetic. The centrality of electoral contests to American politics means that when it comes to building a socialist movement in the United States, there is no option but to take part in them. The Bolsheviks could seriously debate whether to participate in or boycott the State Duma formed after the 1905 Revolution. We cannot. The Duma was a concession from the Tsar to the workers and peasants after the near collapse of his rule. This was very clear to the conscious, revolutionary working class which organized the Soviets. Thus, the Bolsheviks could contemplate whether it would be a better strategy to exploit the limited freedom the Duma provided for agitational purposes or to reject it as a diversion from the complete eradication of Tsarism. In the United States, on the other hand, elections are the sole realm of politics for a large depoliticized mass of the population. For many, the strict separation of politics from the rest of social life is only broken through by the electoral horse race. An election is a ritual which suddenly interrupts normal daily life and gives people the chance to participate in an act of consequence. Even non-voters, those totally apathetic, are suddenly woken up by the media’s continuous coverage of the characters, plots, and scenarios of any good electoral season (especially when the presidency is at stake). When people are possessed by the simultaneous sense of importance and excitement which an election brings, they start to consider what they want from politicians. Personal needs normally pursued through individualized strategies dependent on institutions beyond anyone’s control are elevated to political questions. In that moment a more radical political perspective has the potential to form. That Bernie Sanders’ campaign was so instrumental for a sudden reawakening of the left in the past year and half is proof enough. The real prize of June 26th was not the position Ocasio-Cortez won, but the bond she formed with the electorate. That bond was forged by the efforts of grassroots campaigners, from the DSA and other groups, who went out into the neighborhoods of the Bronx and Queens and presented socialism, in the form of Ocasio-Cortez’s program, to the residents. Her victory solidified that bond, by confirming to each atomized voter, unaware of the choices of the other 26,657 voting in that election, that their individual act was part of a greater collective one. Unconsciously, the ballots they cast transformed them overnight from protest voters supporting a long shot candidate into a potential left-wing base. When Ocasio-Cortez volunteers descended upon the 14th district, they were not merely winning votes. They were planting the seeds of a socialist movement. 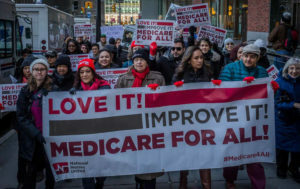 National Nurses United members and supporters march for single-payer health care. Photo: Michael Nigro /Sipa. Now once the bond has been formed, a new struggle begins. In areas where socialist candidates, like Ocasio-Cortez, win or have the potential to win elections, there must be a concentrated effort to turn the progressive electorate into something more than an electorate. For socialism to have a real base, it needs to go beyond just appealing to voters with popular reforms. Many liberals will now try to stave off the threat to their power by adopting the same slogans. What needs to happen is a shift in the consciousness of the Ocasio-Cortez voter from support for certain programmatic points to identification with a socialist movement. It should be emphasized that community members attracted to a left-wing message are not blank slates. They possess the characteristics of the working class– that they are employed in socialized production, paid wages, and work for someone else’s gain– as well as the characteristics of the urban masses more broadly–that they share their extended communal living space with many others, rent their homes, and are dependent upon municipal agencies for many of their everyday concerns. The social position of the urban working class means that socialism, once they have grasped it as a worldview, is not an abstract construct but a form of self-knowledge. Socialist organizations should strive to build organic links with working people in their communities. Socialists need to prove themselves to be popular champions not just at the national level, where their influence is still minimal, but in the thousand little struggles – with employers, landlords, administrators etc. – which constitute daily life in a capitalist society. 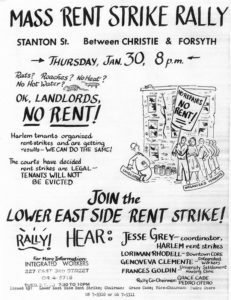 When socialists organize in participatory struggles, we create the basis for working-class people to learn that their interests are not best served by picking now and then from a set of declared programs, but by organizing themselves into a movement which wages a constant fight for their betterment. The question of how the attraction of a reformist program can be transformed into participation in a socialist movement is one whose real substance can only be answered through practice; but certain speculative points can be made. The instruments of this effort should be grassroots level organizations. Efforts should be made to organize committees at the level of neighborhoods and even streets or housing blocs. These committees should focus as widely as possible on bringing in people who are attracted to a left-wing candidate’s reformist programs, and who are willing to mobilize, not merely vote, for it. Mobilization must be accompanied by efforts to raise the political understanding of these participants. This should be a gradual process done in a conscientious, empowering way. The fundamental antagonism between working people and the ruling class needs to be communicated through the way in which political goals, which are still reformist in nature, are framed. Class identity can be built through the solidarity of participation in a political struggle, the activity, duty, and responsibility which comes with that struggle, and the knowledge of that struggle’s relationship with the larger clash of class forces. Theory must come in conjunction with political practice. Marxism as “a unity of theory and practice” is not just a nice sounding slogan but expresses the truth that reading State and Revolution cannot substitute for real activism; but at the same time activism must facilitate a robust socialist perspective which requires a steady assimilation of theory. The key lesson is not simply the working class coming to understand its static position within capitalist society, but its dynamic role as the agent of a socialist revolution. The goal of socialist organizing is to create a working-class movement united by solidarity, cooperation, and egalitarianism, driven by the political initiative of workers as conscious participants in a struggle to abolish classes and other oppressive social distinctions. In this form, the proletariat becomes a ruling class in waiting, the embryo of a socialist society. The propositions above are schematic. They are not so much guidelines as attempts to grasp the sudden opportunity presented before us by the leftward electoral shift we are observing. My purpose has been to try to relate the present situation to the broader aims of our movement. The two alternatives, of being scornful of electoral success because it isn’t “revolutionary” enough or of being so intoxicated with sudden electoral victories that the fundamental task of organizing for socialism is forgotten, are both one-sided. If there is one thing I want the reader to take away it is this: only when socialism becomes part of the consciousness of working people, when socialist organizations become interwoven with the social fabric of their communities, when a socialist party forms a durable bond with them, can we really speak of success. If electoral momentum is utilized in the proper way, elections can win us more than seats in congress. They can win us a movement. Originally posted on the Solidarity website. Cyryl Ryzak is a Solidarity member living in Portland, OR. 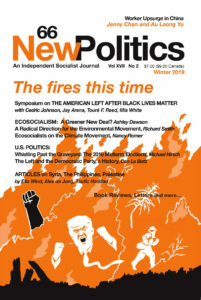 ‹ The Rebirth of Social Democracy in the U.S.